In October over 2260 individuals arrived in Lesvos from Turkey. During the same period, only 1189 asylum seekers were allowed to leave Lesvos and provided with accommodation on the mainland. This brings the total population of refugees and asylum seekers in Lesvos to approximately 8000, with an estimated 6000 staying in or around Moria Refugee Camp. Last month we reported on the inhumane conditions in Moria, and this month these problems have only compounded, putting asylum seekers lives in acute danger. Now, over 1000 children are living in Moria, unaccompanied minor children are living together with adults, and 3000 individuals are living in summer camping tents without heating. Reception conditions do not come close to “ensur[ing] . . . a dignified standard of living,” as required by EU Regulations (Recast Reception Conditions Directive 2013/33/EU). Tragedy has already befallen asylum seekers in Lesvos. Two residents of Moria died in October – a five year old Syrian girl, and a 43 year old Iraqi man. While both reportedly suffered from prior medical conditions, the access to health care for asylum seekers remains appallingly inadequate. The Greek State has received 700 million Euros to manage the arrival of refugees, and it is the obligation of the Greek State to ensure adequate standards of living and health care. However, solidarity and volunteer groups continue to be the key actors working daily directly with refugees and asylum seekers. Boat Refugee Foundation (BRF) and Emergency Response Centre International (ECRI) are the main providers of health care in the camp, and both are volunteer based organizations. Volunteer and donation based organizations such as Attika warehouse have also provided many of the tents in Moria and winter products distributed among the refugees. 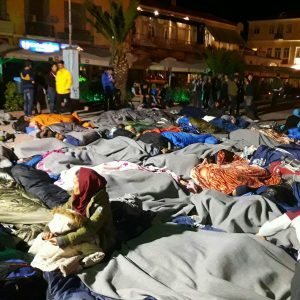 As a result of the abysmal conditions refugees face in Lesvos and other Greek Islands, October saw the convergence of many different actors in the Greek islands and throughout Europe joining forces to call on the Greek government to open the islands and allow asylum seekers to travel to mainland EU. On 12 October, the Legal Centre Lesvos joined a collective of what has now grown to over 100 solidarity groups and grassroots organizations from the Greek islands, mainland Greece, and abroad, calling for urgent action from Greek government to address the untenable situation for refugees on the Greek islands. We demand that the EU government protect the rights of asylum seekers and immediately cancel the inhumane EU-Turkey deal, and allow refugees free movement rights. 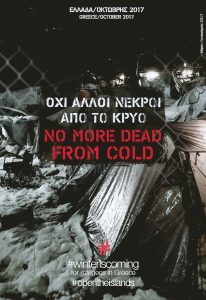 On 23 October, the call to open the islands was echoed by larger NGOs and human rights organizations such as Human Rights Watch and Amnesty International, who the Legal Centre Lesvos joined in issuing an additional statement recommending that the Greek state allow asylum seekers free movement throughout Greece. 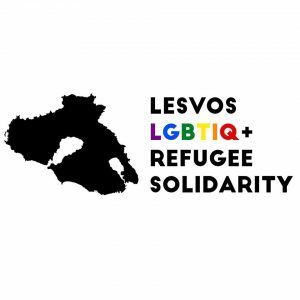 Lesvos LGBTIQ+ Refguee Solidarity also published a damning report on the complete lack of protection for LGBTIQ+ refugees and asylum seekers in Lesvos. Many face continued persecution and revictimization within Moria, on the streets of Lesvos, and from Greek authorities. They also demand that the islands be opened to allow LGBTQI+ refugees to reach safety on mainland Europe. On the 20 October, due to the insecure, inhumane conditions, many families – the majority from Afghanistan – fled Moria Refugee Camp with all of their belongings. That night they slept in the street, rather than return to Moria Camp. The next day, despite attempts by the police to block their passage, they walked to Mitilini and occupied Sapfous square in central Mitilini. 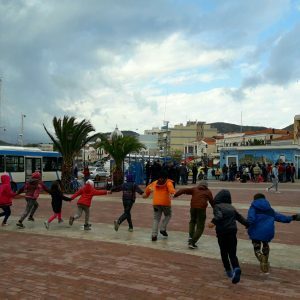 The occupation of Sapfous Square appears to have happened organically without prior organization or planning, in reaction to insecure conditions that refugees face when they arrive in Lesvos and are forced to stay in Moria Refugee Camp. 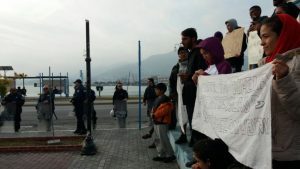 Since 21 October, Afghan families and Kurdish and Iranian refugees have staged a sit-in in Sappho Square. Their central demand is to be allowed free movement rights to travel throughout Greece. The demands of those occupying Sapfous Square are in line both with international law and the Greek constitution which recognize free movement rights. Throughout the past twenty days of protest, the police continue to have an intimidating presence in and around the Square. They routinely stop Europeans who are present in Sapfous Square, asking for IDs, threatening arrest, and demanding information about what individuals are doing in Greece. The attempt to intimidate Europeans from speaking with the protesting refugees and documenting their testimonies plays into a practice throughout Europe of keeping refugees out of the public eye, in refugee camps far from urban centres, where systematic violations of refugee rights can take place with impunity. Despite the attempts by the police to silence the protesters and solidarity groups, Greek activists and solidarity groups including from Musafarat collective against detention centers, Κατάληψη στο Μπίνειο (Binio Squat), Εργατική Λέσχη Λέσβου (Workers Union Lesvos) and No Borders Kitchen Lesvos have led solidarity actions and provided support to the protesting refugees throughout the past twenty days. 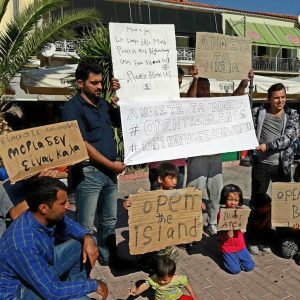 In addition to organizing to put pressure on Greek and European authorities to open the islands, the Legal Centre Lesvos will continue to monitor the police’s response to the occupation of Sapfous Square so that the right to protest is respected, and that any violation of this right is documented. Welcome to Europe held a memorial in Thermi, Lesvos on 25 October in remembrance of the victims of Fortress Europe, who died at sea attempting to reach the safety of Europe, or who died while trapped on Lesvos. A second memorial was held in Eftalou organized by Phillipa and Eric Kempson of the Hope Project, to mark two years since the preventable tragedy in 2015 when dozens were lost at sea attempting to reach Europe. The Legal Centre Lesvos condemns the EU policies of exclusion which continue to arm the repressive Turkish regime, and fail to provide safe passage to individuals fleeing war, persecution and imperialist policies of economic and environmental exploitation. In July and August we reported on the lack of legal aid available for asylum seekers on appeal, in direct violation of their right to legal aid on appeal under Greek Law 4375, Article 46. Two months later, the individuals who appealed the rejection of their cases without a lawyer are now being rejected on appeal and deported to Turkey. This includes one individual who was politically involved in the Democratic Republic of Congo, and faces persecution if returned there. As is the case for many sub-Saharan Africans, his claim was rejected on credibility after being interviewed by a European Aslum Support Office (EASO) “expert”. In theory, EASO does not make decisions, but issues an opinion after the interview(s) which, along with the interview transcript, forms the basis of the Greek Asylum Service decision. This is particularly concerning when it comes to determinations of credibility. Often, minor inconsistencies and a detached manner of recalling events are used to find individuals non-credible – when these are the very symptoms that a survivor of trauma might express. As just one example of the callous institutional attitude of EASO, and the prioritisation of securitisation over upholding international human rights and refugee law, one EASO officer was overheard in a Mitilini cafe this month stating that “All Africans are lying”, and the primary role for EASO in Greece is to protect Europe from Isis. “All Africans are lying,” - EASO Officer, Lesvos, October 2017. Unfortunately, rejection on appeal is not limited to individuals without a lawyer and the Appeals Committee have served mainly to rubber stamp the initial decision made by the Greek Asylum Service. The recent European Commission report on implementation of the EU-Turkey Statement shows that ONLY 1 % OF DENIALS OF INTERNATIONAL PROTECTION WERE REVERSED ON APPEAL in cases made by non-Syrians from the Greek islands. This lack of effective remedy is a clear violation of asylum seekers right to access justice. Given the large number of inconsistencies reported regarding interviews conducted and decisions made in Lesvos, these statistics are alarming and have tragic consequences for the individuals who have risked everything to reach the safety of Europe, only to be returned (via Turkey) to the countries where their lives may be at risk. Prohibitively expensive court fees and lack of sufficient legal aid actors on Lesvos has meant that asylum seekers are unable to challenge these routine violations in court and there has been no effective remedy or redress for violation of their rights. The illegal practice of detention based on nationality for the duration of examination of applications for international protection continues, and has been extended to single Syrian men. This apparently is following the Council of State decision from last month which found that Turkey was a Safe Third Country for Syrians. HIAS successfully challenged the detention of three Syrian men, however, the three were released based on individual circumstances, and the general practice of detaining single Syrian men upon arrival continues. Lawyers working with detained individuals have reported that detainees lack basic information about their rights – such as the right to appeal, and to information about their application in a language they understand. Lawyers have also reported that detained individuals do not have access to effective legal aid as police limit the amount of time detained individuals have to consult lawyers and often interrupt confidential consultations. The practice of keeping individuals in detention throughout the processing of their applications for international protection have horrifying consequences for the individuals detained, and due to limited access it is difficult to monitor the extent of violations taking place. There have been several reports of self harm and suicide attempts by individuals detained in Moria Camp. The Legal Centre has long denounced the illegal practice of detention based on nationality without individualized assessment, as this practice violates asylum seekers right to effective legal aid, and be free from arbitrary detention, and to be free from discrimination based on nationality. During October 2017, the Greek Asylum Service changed its containment policies for asylum seekers who arrive to Lesvos. In the past several months individuals were made to wait until at least after their first interview with EASO or the Greek Asylum Service in order for their request to have geographic restrictions lifted considered. Thousands of asylum seekers are contained for months, some for over a year, on Lesvos awaiting the decision on their applications for international protection. For several weeks in October this practice shifted and individuals who were able to establish that they are vulnerable (a legal term under Greek law) at the full registration of their application for international protection were allowed to travel throughout Greece. Many of these individuals were transferred to the mainland and had their cases transferred for processing by the Greek Asylum Service in Athens and Thessaloniki. As of the end of October, this policy has been rescinded, and once again individuals must appear for their first interview regarding their application for international protection in Lesvos before the Greek Asylum Service will consider lifting geographic restrictions. The constantly changing policies and inconsistent and arbitrary treatment of asylum seekers has led to increased tensions within the refugee population in Lesvos as new arrivals have been allowed to leave the island and have been provided with housing on the mainland while many others face a second winter in Moria. “Vulnerability” under Greek law has been used as a criteria to lift geographic restrictions. But, as we have seen in many cases, non-visible vulnerabilities such as psychological problems and trauma frequently go unrecognised, despite being indicators of vulnerability under Greek Law 4375, Article 14(8). Moreover, while vulnerable asylum seekers are guaranteed certain safeguards and protections under Greek law, those found not-vulnerable also possess a significant bundle of legal rights which are currently being violated. All asylum seekers have the right to adequate reception conditions, to access a fair process, and to freedom of movement – all of which is being routinely violated in Lesvos, and in particular for those living in Moria Refugee Camp. Three months after the July 18 arrests, the preliminary hearing procedure in the case of the Moria 35 has closed. A trial date has not yet been set. The three Bambara speaking defendants provided their own interpreter and agreed to be interrogated. With representation by HIAS and Legal Centre Lesvos, the three were ordered released with restrictive measures awaiting trial. With the conclusion of interrogation of all 35 defendants, the preliminary procedure now has closed and we await a trial date to be set. While five of the 35 defendants are free in Lesvos awaiting trial, 30 have now been detained for three months, awaiting trial, despite lack of credible evidence against them. Meanwhile, investigation of excessive use of force by the police against the 35 is ongoing. Several individuals who had filed complaints against the police for excessive use of force were visited by police while in detention, as part of the police department’s own internal investigation. Each year since 2012, the Paris Bar organises a Pro Bono Award Competition which rewards solidarity actions led by Parisian lawyers. This year, among the thirty candidates who presented their projects, Norma Jullien, one of the co-founders of the Legal Centre Lesvos, was nominated. On Tuesday 10th of October, the Pro Bono Award Ceremony took place in Paris and gathered nearly 400 lawyers and many representatives of the associative world. 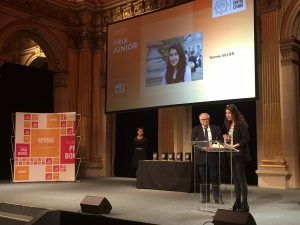 On this occasion the Henri Leclerc Prize dedicated to trainee and young lawyers has been awarded to Norma Jullien for her action in favor of the refugees of Lesvos and her work with the Legal Centre Lesvos. After having dedicated her award to the entire team, Norma Jullien recalled the degrading and inhumane conditions in which the Moria camp population is staying, the systematic breaches of human rights they are subjected to and the crucial role of the international community of lawyers to fight these abuses. Currently training at the Paris Bar School, Norma Jullien will be fully qualified to practice as a French lawyer next autumn 2018. 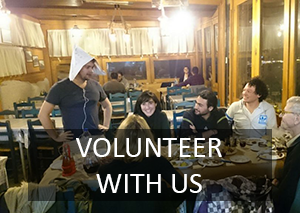 Meanwhille she remains involved with the Legal Centre Lesvos from abroad as a volunteer coordinator.